We’ll add new photos in Oct/Nov when it’s further along. Construction continues apace on the new Academic Center. Summer work on the campus sidewalks, landscape, and plazas is well under way in anticipation of completion before the fall term. 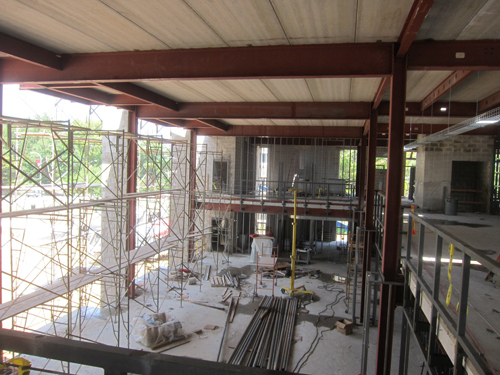 The structural frame of the Learning Commons building is in place, and the installation of windows, walls, equipment and finishes continues to move quickly. A new glass and steel atrium will soon link the new building and the Drexel Library, where renovations should be completed for the start of school. The overall project is scheduled to open in January of 2012. Follow the construction progress LIVE on the renovation web cam!